Hope you all had a lovely Valentine’s Day and weekend! 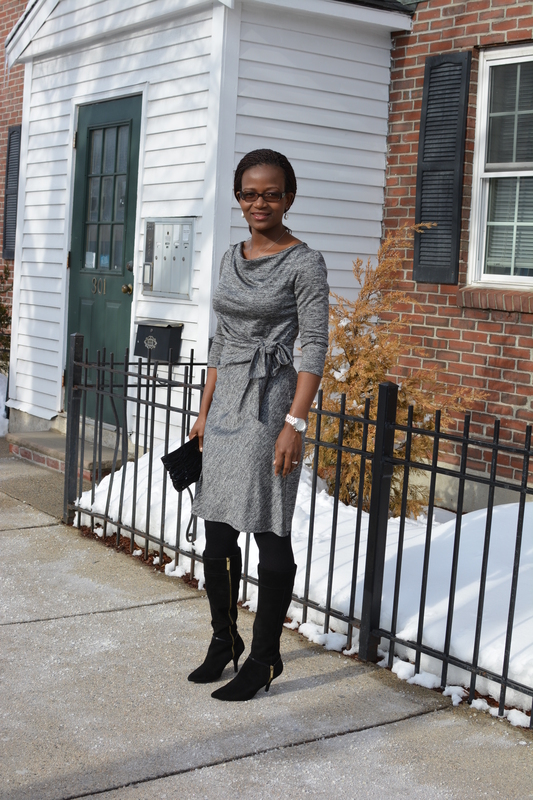 Today, I am featuring one of my favorite dresses from Ann Taylor. It’s a charcoal grey crawl neck jersey dress that I got in 2012.This dress was pure love at first sight; well I have to confess that I got it in three different colors; It was going for 60% off and I couldn’t resist the temptation! This grey one has a thicker winter material; it’s the most versatile of the three. It has become my “to go” dinner dress and it is also suitable for the office. The leather sued boots are my most recent bargain; I got them for FREE from Macy’s. I used my heavy duty coupons as well as my rewards from their thanks for sharing program. Cute dress! You can never go wrong with Ann Taylor! One of my favorite places to shop!! Gray and black – that’s what I call style! Very sleek and classic look!